Chinua is the pioneer Chief Executive Officer of InfraCredit. He has garnered over fifteen (15) years of experience in corporate/structured finance and debt capital market roles. 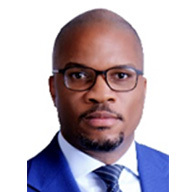 Chinua has a strong and practical know-how of local capital markets with a firm interest in market development, and has acted as a key adviser in the establishment of development finance institutions including the Nigeria Mortgage Refinance Company. He was the project lead for the establishment of a Nigeria Credit Enhancement Facility and prior to this role, the Managing Director of Dunn Loren Merrifield Advisory Partners, a corporate finance advisory firm. He holds an M.Sc. in Finance & Financial Law from University of London and studied law at the University of Lagos. He is currently the chairperson of the Regulation Consolidation Sub-Committee of FMDQ Debt Capital Market Development Project.